On tour with genealogist Margaret Weiler in the Schwaebische Alb of Germany, we learned yesterday something very interesting from the former pastor of a very old church in the town of Heiningen. 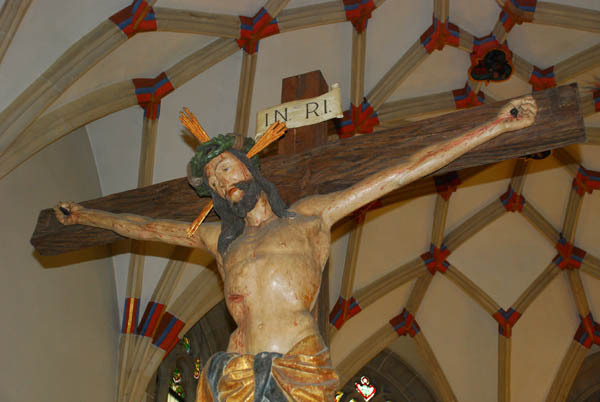 “Crucifixes were developed in Spain at the end of the 14th century to remind people of the hideous treatment of Jesus by the Jews,” said former Pastor Wagner. “Before then, the only depictions of Jesus found in churches was as the shepherd.” This really made an impact, as the only image seen in most churches is Jesus on the cross, in great pain, bloodied, torn. To know that this was a political statement carried around the world made one think. Posted in Family History Tours and tagged crucifix, origin, spain.